The SCB/MSCB slide-clip connectors are high-performance connectors for bypass framing applications designed to reduce design time and overall installed cost. Various anchorage methods have been tested, and the resulting allowable loads eliminate the need to design connector anchorage. The SCB/MSCB can accommodate applications that typically require two parts with a single connector, reducing material and labor cost. These connectors are manufactured in five different lengths to accommodate a variety of standoff conditions and steel-stud sizes. Submittal/substitution request for SCB/MSCB bypass framing slide-clip connectors for cold-formed steel construction. Loads for SCB/MSCB Bypass Framing Slide Clips on Steel with Vertical Leg Less Than 4"
Simpson Strong-Tie has evaluated the performance of the SCB/MSCB when attached to a steel supporting structure where the steel vertical leg is less than 4" wide (two specific conditions). When the SCB or MSCB connector is used with two shouldered screws, the screws may be installed in any two slots. Allowable loads are based on clips installed with (4) #12-14 screws in the anchor leg. 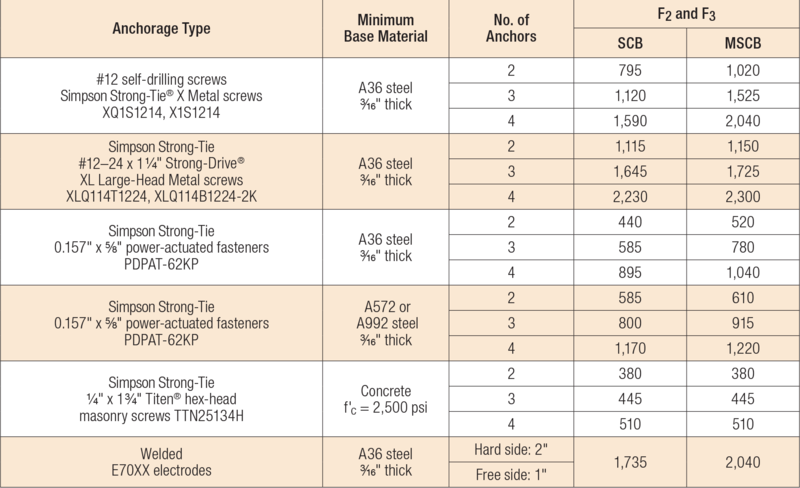 For other anchorage installations, the capacity of the connection system will be the minimum of the tabulated value and the allowable load from the SCB/MSCB Allowable Anchorage Loads table below. 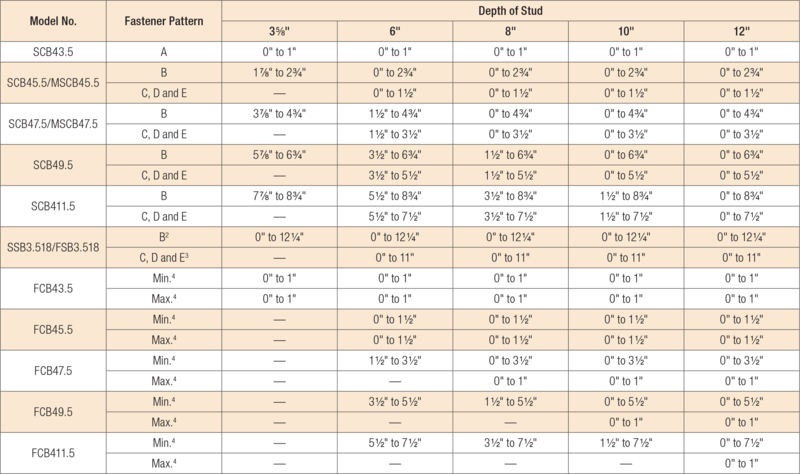 Reference tables below for for LRFD design strengths. Allowable loads are for clip anchorage only. The capacity of the connection system will be the minimum of the tabulated allowable anchorage loads the allowable load from the SCB/MSCB Allowable Connector Load table above. Allowable loads for #12-24 self-drilling screws and PDPAT powder-actuated fasteners are based on installation in minimum 3/16" thick structural steel with Fy = 36 ksi. PDPAT values are also provided for A572 steel. 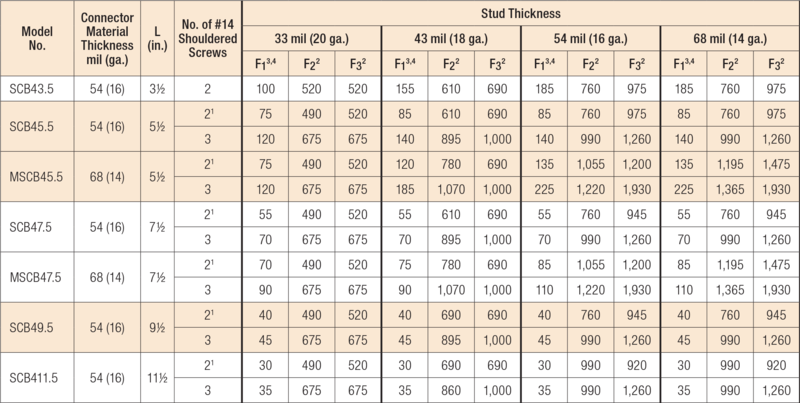 Values listed above maybe used where other thicknesses of steel are encountered provided that the fastener has equal or better tested values into thicker steel (General Information). It is the responsibility of the Designer to select the proper length fasteners based on the steel thickness installation. Tabulated values are for the anchorage only. 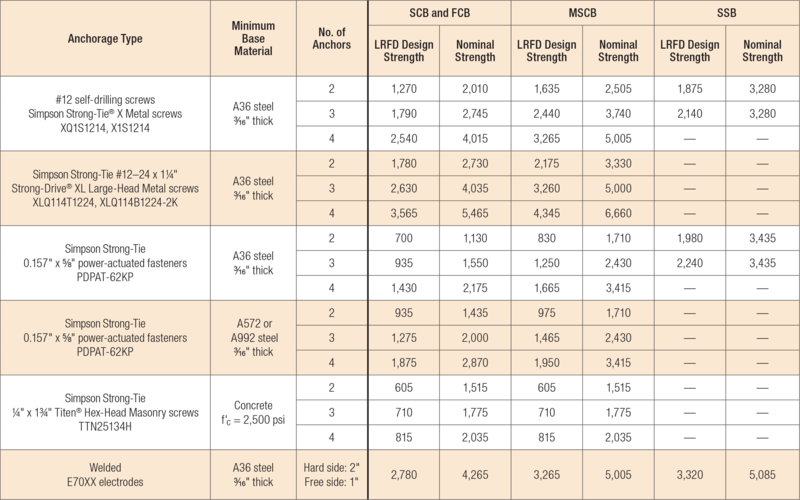 The assembly strengths are the minimum of those listed above and the connector capacity and attachment to the stud-wall framing listed in the SCB/MSCB Service Load Limits, LRFD Design Strengths and Nominal Strengths table above. 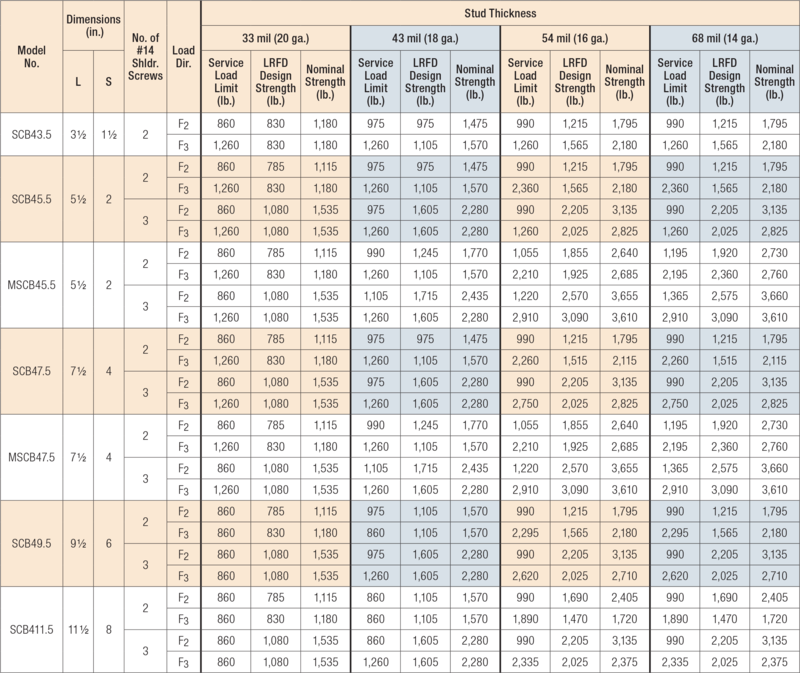 For the Service Load Limit, use the values listed for the connectors in the SCB/MSCB Service Load Limits, LRFD Design Strengths and Nominal Strengths table above. MSCB No evaluation report listing. SCB See specific model numbers for code listings.